Born, raised and still live in Staffordshire (well, technically born in Shropshire (Shifnal) but family lived in Staffs, so you know....) I have been sculpting professionally since 1984 and, as well as producing work under my own name, have worked with companies including Coalport China, Wedgwood, Royal Doulton, Danbury Mint, Holland Studio Craft, the Dragonsite.com and most recently Nemesis Now. I guess I am probably best known for being the creator and author of the fantasy range Enchantica. I'm nuts about history, folklore, legends, wildlife and nature - and completely fascinated by fir cones, natural engineering at its finest and most elegant. ​Obviously I'm into fantasy art - far too many influences to mention here but I suppose I'd have to credit Harryhausen, Frazetta and Rackham for sowing the seeds. ​I am currently reading Killers of the Flower Moon by David Grann. Mark Malizia has practiced three-dimensional metal sculpting for 15 years. Keen observations of nature inspire this self-taught craft. Mark has held a relentless passion for fishing all his life. It has endured because he is not only drawn to the big catch, but the awe-inspiring beauty of the sea. He is fascinated by the interplay of light, movement and form found on the ocean. This is realized in the unique depths and finishes of Copper Art. All of his sculptures are designed by him and reproduced in his private studio on the island of Bali, Indonesia. 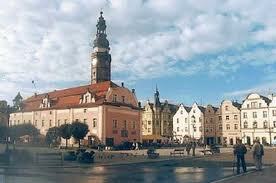 From my hometown, Boleslawiec, I proudly present handmade and hand painted Polish Pottery. Our company is family-owned and family-operated. My brother and his wife, Jacek and Weronika, own and run the factory in Poland and I am the wholesale distributor located near Seattle, Washington. For over 600 years, Polish Pottery has been handmade and hand painted with beautiful unique designs and patterns. Our factory continues this tradition making each piece perfect for mix and match Collections. Having used Boleslawiec dishes throughout life, introducing our brand of pottery is my pleasure. All products are great for baking in the oven up to 350°F, and are microwave, dishwasher and freezer safe. They are also scratch & chip resistant, lead-free, non-toxic and ecologically safe. Each item is durable, functional, versatile and great for display. The artists sign the Unikat/Unique and Artystyczny/Artistic patterns and all pieces have the Company Logo stamp. The brand’s designers hail from around the globe including Taiwan, China, Japan, the United States, France, Germany and Israel. These rich and varied cultural backgrounds reflect FRANZ’s commitment to diversity and ensure that FRANZ designs remain international and cross-cultural in their appeal. 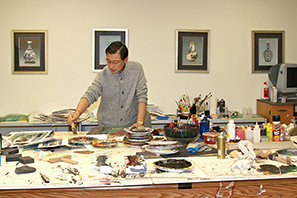 Complex technical steps allow FRANZ to produce unique artworks that are vibrantly colored and have three-dimensional details and relief. After sculpting exclusively in bronze for large public monuments and hundreds of Christian church commissions, Schmalz continues to work on large scale projects around the world. Born in rural Ontario, Canada in 1969 and only 40 years later Timothy is by far one of the most prolific artists of our time. Much like the past masters, his calling to the fine art of sculpture was a spiritual one. The best insight to how he feels about his vocation is his mission statement: “I am devoted to creating artwork that glorifies Christ. The reason for this devotion, apart from my Christian beliefs, is that an artist needs an epic subject to create epic art. Schmalz philosophy on sculpture is simple; work should be beautiful and tell a story of something. Sculpture is a form of communication, just like speech. The power of the sculpture is determined by what is represented, for instance, a great historical event is a subject that will lend itself to becoming a great sculpture. Schmalz continues to seek powerful, meaningful, subject matter for new creations. Raised around his grandmother who was a potter, Danko began throwing clay at a young age. He attended an art academy where he studied painting but continued to practice his ceramic skills. 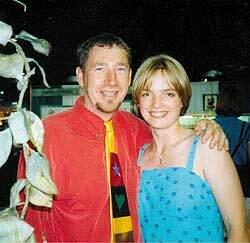 During a trip to Prague in the late 1990's, he was fascinated by the sense of design and color displayed in the work of Czech artists. 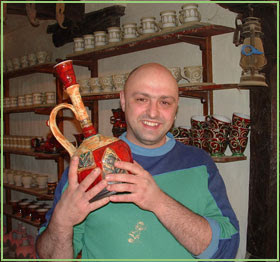 Coming home with renewed energy, he started creating a new style of pottery. As master carver, Peter is the man responsible for the humorous Treasure Jest™ series. His works have captured the attention of collectors worldwide, although interestingly he has had no formal arts training. Born in 1960 in Hereford, England, he first picked up a piece of modeling clay at the age of three but didn't pursue sculpting for nearly thirty years. He worked odd jobs during his youth, and when he fell short of money he painted china, a craft he had acquired when he worked as a ceramic artist at Boehms of Malvern. He works full-time as Harmony Kingdom's most prolific and well-recognized master carver. We can still enjoy his writings in the quarterly column "Planet Calvesbert" in Harmony Kingdom's newsletter "The Queen's Courier." McHarp began in early 2000 by a mother and daughter, Ruth McNay and Linda Harp. Their talents were brought together with the goal of producing a product that would allow them to explore and honor their heritage and express their love of beauty, balance and harmony. They faithfully and loving created McHarp designs, replications of ancient crosses, scenes from historical and memorial crosses, and original designs. In October 2014, Jim and Kim Keeter purchased McHarp with the intention of continuing the vision and journey that Ruth and Linda began. We are a husband and wife team with 3 children participating as they are able. Our middle daughter, Mackenzie, the artsy one takes an active role in the creation of the crosses, she has learned from Linda the design and casting process. Our oldest, Ashley, currently a college student, plans on assisting with marketing and sales. Our youngest, Tres, 2 years old, will be playing at our feet for several more years before he takes an active role… So this is truly a family affair. David Scherer is an American Artist who works in a variety of mediums, bringing an intriguing style and vibrancy, to all of his three dimensional works of art. Well known for his 3-D Clocks, Scherer’s pioneering focus and innovative techniques, fuse the explosion of textures and colors to ignite energy evident in every creation. Scherer attributes his unique direction to the expansion of his cumulative experience of more than 30 years as an artist. Scherer has been a featured artist in the Angel’s Garden Gallery Collection for over fifteen years. Benjamin Chang was born near Shanghai, China. From an early age he was drawn to all of Art and loved drawing, painting and sculpting. During the Cultural Revolution he was sent to a farm but his yearning for artistic expression could not be contained and soon rakes were invented to create paints brushes in the mud. Leaves, branches, grasses, rocks and river stones were collected and repurposed to create sculptures showing the bounty of nature’s colors and shapes. Soon the townspeople noticed his creations and word of his talent spread all the way to Beijing. After seeing his work, the Chinese Government brought him to Beijing and dedicated his time to creating art for the Party. The visibility of these projects soon brought international attention. Recognizing his talents and future San Francisco’s Academy of Art University gave him a full scholarship for a Master’s Degree. Ben fell in love with San Francisco and chose to make the City his new home and today all of his designs and creations begin in his San Francisco studio. His chosen medium is Fused Glass because of its sculptural qualities can be combined with painting to create truly unique pieces. Ben has always believed that everyone should enjoy the beauty of art so he pioneered techniques to make his art affordable. Today a guild of artist selected by Ben and taught by Ben recreates his work to achieve his affordable mission. Although Ben receives large public commissions for a one of-a-kind-piece, he has found affordable art his greatest joy because it has brightened the lives of so many. What began in a small village today encircles the globe and his art is found in Asia, the Middle East, Africa, Europe, and North and South America. Kitras Art Glass is a family run, Canadian company, with a strong belief in finding, making and sharing the Everyday Beautiful. In 1988 when husband and wife duo, Stephen and Elke Kitras moved to small town Fergus, Ontario, Stephen set up a small studio and produced every piece himself, shipping it from their dining room table. After a few years of working the craft show retail market Kitras Art Glass expanded into the wholesale market in 1994. In this year the single most important factor in our growth was the start of exports into the United States. This move initiated a major growing phase for the company and by 2001 we had expanded to over 40 employees. A new facility was built to accommodate the increased production demands. These years were exciting but not short of struggles. In 1999, the company suffered the loss of Elke Kitras to Leukemia. Her vision of celebrating beauty in all parts of life is still the driving factor behind every piece they create. Kitras is Canada’s largest hot glass studio and will be celebrating 30 years of the Everyday Beautiful in 2018! Although Stephen is still a part of the company, his children have taken a large role in bringing the company forward into a new stage of business. McIntosh Fine Bone China takes the great artists like Bateman,Van Gogh, Renoir, Klimt, and Monet and puts their art on functional drink ware. The McIntosh brand partners with leading factories and designers around the world to create a world class group of quality products that are in line with today's modern lifestyle. McIntosh specializes in fine bone china coffee and tea mugs which are beautiful and functional. The McIntosh Family have been pioneers in the Gift and Tabletop industry since 1906. The constant theme through 100 plus years has been excellence in customer service, high standards for quality, and delivering products of great value and relevance. 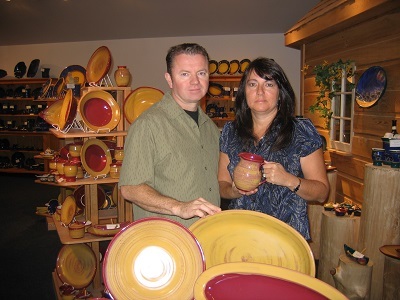 In 1991 Daniel Maxwell and his wife Jodi returned home to Northern Ontario to establish their Pottery Studio. Daniel attributes his pride of craftsmanship and tasteful use of colour to having studied and worked at Sheridan College School of craft and design in Oakville, Ontario for nine years. Daniel says to his customers “I make functional pots,I want people to enjoy them for their utilitarian qualities as well as their decorative appeal. Daniel’s lead free pottery is dishwasher, microwave, and oven safe and brings many years of pleasure. Today, The Trail of Painted Ponies is proudly celebrating 15 years of horses in art and it has become one of the premier art and collectible companies in the world, crafting one of the most cherished collectibles in America, The Trail of Painted Ponies figurines. These miniature works of art are prized by collectors who appreciate artistry and fine craftsmanship. With this dedication to creativity and compassion, The Trail of Painted Ponies continues to blaze new trails in the world of fine art, collectibles, philanthropy. has helped raise over $1 million dollars for non-profit organizations. The recycled 55-gallon oil drums are first removing the round tops and bottoms, placing them inside the barrel along with dried banana or sugar cane leaves. The drum is then sen on fire to burn off any paint or residue. After cutting the cylinder from top to bottom, it is flattened with much pounding and then cutting out a piece to out of which the art will be created using chisels and hammers and other primitive tools. The design is first drawn with chalk onto the metal. The finished piece is signed by the artist and coated with a protective finish. More recently, by 2010, her ‘passion for fashion’ becomes a driving force! Taking advantage of her hands-on experience and expanding knowledge in the industry, she triumphantly launches a line of jewelry. She is soon working with 31 factories in the Orient, ensuring top quality and diversity in her lines. “Jacqueline Kent’s Inner Circle, Inc.” becomes the heart of the brand! Today, Jacqueline is proud to bring home to Canada, a collection of timeless favorites and fairy tale classics! Her trend-setting jewelry lines feature a dynamically styled array of necklaces, bracelets, earrings and rings, from delicate to bold, or carefree to classic, with many hand crafted with Swarovski elements, for stylish expressions. Since every piece is individually crafted, the same vase may vary in color and size.